Although it may not appear to be as crucial as covering the mandated curriculum or helping students pass standardized tests, establishing a strong classroom community is a key component of the positive academic environment that can generate student success. Students who are part of classroom communities feel safe, respected, comfortable and engaged. The positive atmosphere that exists in a classroom community prevents many of the problems that can plague a disorderly class because students work and learn together in harmony instead of disorder and disruption. Some educators may doubt the power of a classroom community or may not want to spend valuable instructional time on something as indeterminate as community building. The benefits of a classroom community, however, clearly outweigh any potential problems. Students who feel a connection to their classmates, to the class as a whole, and to their teachers are much more likely to behave with courtesy and self-discipline. 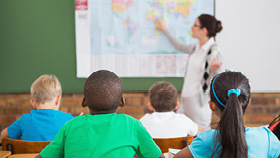 The connections in a classroom community encourage persistence in achieving shared goals, tolerance and respect for others, and effective communications skills—all important life skills. Every classroom is uniquely formed by the teachers and students who create it, but classrooms where there is a sense of community have several characteristics in common. Teamwork and team spirit are clearly evident. Students often work together on shared goals in various large and small group configurations. The overall class atmosphere is inclusive and welcoming. No one is left out. While student differences are recognized, they also are accepted as potential strengths. Success and effort are recognized and celebrated. Students know what to do and are confident they are either on the right track or are busy learning what to do to succeed. The interactions among students and between teacher and students are overwhelmingly positive, friendly and focused on learning. Students are engaged and active as they work together. They share materials, responsibilities and ideas. There is a strong sense of student ownership in the physical classroom environment as well as in the workload and instructional choices. Many routine tasks are delegated and managed by students. Unlike many educational programs, building a classroom community does not require a large budget or the investment of lots of instructional time. Instead, what veteran teachers have found to be effective is the acknowledgment that it takes patience to build a classroom community over the course of a school year. Some students may bond right away; others will take longer to feel comfortable and acclimated to the group. Building a classroom community cannot be accomplished with one or two actions; it is a process that requires deliberate thought and planning. The first step is to set up the physical space in your classroom so that students can function well as members of a team. Take into account the various activities that must be performed in your classroom each day so that you can create flexible arrangements of furniture and materials. Be careful to consider traffic flow patterns when planning room arrangements so that students can move about with ease. Encourage student ownership of some interactive parts of the room such as word walls, calendars and message boards. This will make it easier for you to delegate routine tasks. Create a bank of shared supplies for students who may need to borrow paper or pencils. Set aside a space with accessible materials, school supplies, books or handouts that students can locate and distribute themselves. Set up a recognition area that showcases student achievements as individuals, groups or as a class. how to engage students in shared activities that will allow them to develop a sense of belonging to the class. As a final note, before you begin working on this exciting approach to creating a positive and engaging classroom environment, it’s helpful to take some time to brainstorm the overall vision you have for a community in your own classroom. What would the ideal community look like in your teaching practice? What would your students be doing? What obstacles can you anticipate? Where can you find help overcoming those obstacles? What outcomes would benefit your students most? What would it mean to your students to be part of a caring and supportive classroom? Can't wait to read the next post.